Kids love jokes, but need to learn not make hurtful jokes and then how to deal with hurtful jokes. Here are some hurtful jokes. Laugh at these? Someone didn’t? Cruel jokes are the sign of prejudiced minds. Hope these jokes offended you. 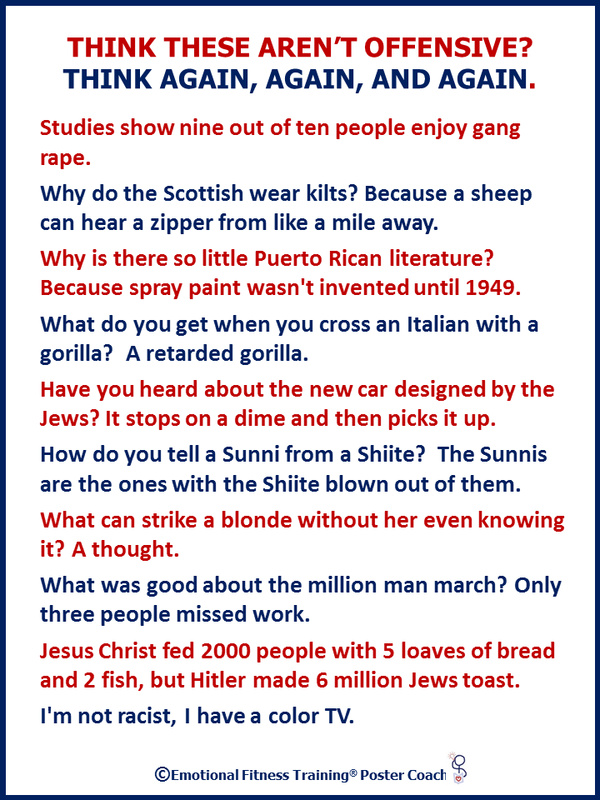 Offensive jokes illustrate how prejudiced the human race is AND we all have our prejudices. Why? One reason: Our brains like to keep things simple and easy. Simple leads to the twisted thinking called generalization. Another reason: Part of being social animals means figuring out where you rank. We constantly compare ourselves to others. Then, we create mean jokes so we will feel better about ourselves by putting others down. Thinking you are not bound by some false ideas about groups of people is delusional. Think about the early hurts in your life and how that lead to a prejudice on your part. Here’s a personal example, when I was five-years old a red-head came up to me on the play ground and for no reason I could figure out slapped me across the face and walked away. And yes, I remain a bit wary about red heads. A personal prejudice that I own and work against. Personal hurts that generalize to a specific group. Following the crowd whether school mates, religions teachers, the media. Parenting tip one: Remember age and stage. The younger your child the more hurt by others will lead to prejudices. Think of the stored up prejudices against parents which stay hidden until the teen years. Combat early hurts by clearly labeling some as accidents. Label intended hurts as wrong. Punish your child if s/he intentionally hurts someone. As your children enter school, gently dispute prejudices particularly those on the media. Talk about why others hurt people. Teach how to handle hurt and anger in healthy ways. During the pre-teen and teen years talk directly about prejudices. Very useful topic for family meetings. Parenting tip three: Reduce your prejudices by doing the following. Talk of specific acts of specific people. When labeling behaviors think of the following words: kind, cruel, dangerous, thoughtless, criminal,evil. Some unacceptable words can be linked. These include thoughtlessly cruel, criminally dangerous, or evil and cruel. Know that all group labels are guilty of generalizing and generalizing is twisted thinking. Every person is unique and a blend of traits. Seek balance.When labeling a person’s behavior think how cruel, how often, to how many. Also think balance: how kind, how often, to how many, and for what reason. Do the same with cultures. Remember what matters; be grateful; practice kindness; laugh; play; enjoy the good; speak out against the bad, but in thoughtful ways. What you do and how you do it matters. Protest offensive jokes. How? Don’t laugh. Raise you eyebrows and look a bit disgusted. Stay you find the joke highly offensive. Use such jokes as teachable moments for your kids. Take less offense if the teller is a comedian or cartoonist. Some cultures suggest killing cartoonists who offend – an evil and cruel practice. April Fool’s Day 2015 was one source of inspiration. Word Press’s Daily post’s DAILY PROMPT: Fool Me Once It’s April 1st! Pull a fast one — publish a post that gently pranks your readers. I didn’t prank, but I was inspired. Like any coach, EFTI’s poster coaches inspire, teach, motivate, and reinforce thinking about what matters. To use, print up in color and post there it will be seen often. If not soon if for you, let me know and I will give it priority status. Poster Coaches can also be used at Family Meetings to start a discussion about what matters. Most are free now, but I do plan to start charging for some in the near future. This entry was posted in Parenting Issues and tagged Cruel jokes, Emotional fitness, Emotional Fitness Training, Emotional Health, emotional intelligence, Katherine Gordy Levine, Parenting advice, parenting teenagers, parenting tips, Parents Are People Too, postaday, Prejudice. Bookmark the permalink.